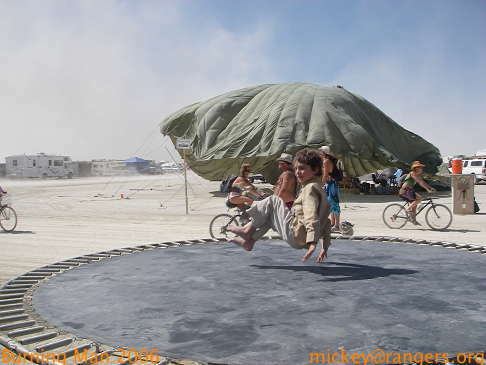 The kids are used to the playa dust. Isaac doesn't even pause in his trampoline time as a whiteout thunders toward us. The kids have both goggles and masks nearby, but only use them when it takes a while to clear. 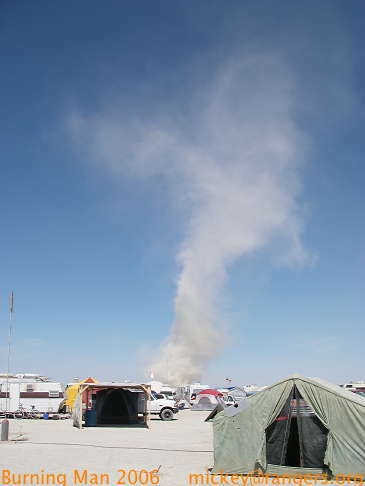 Here's a more typical whiteout: like the dust devil the playa dust is being driven by wind, but here everything is blanketed for minutes at a time, perhaps even as long as a half-hour. Then it's time to hunker down with old friends or new friends. 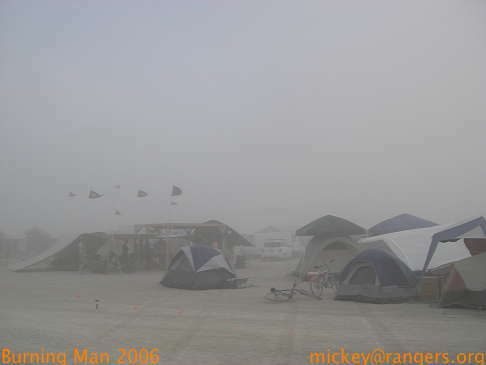 It's considered good playa etiquette to ask to enter the nearest camp during whiteouts. 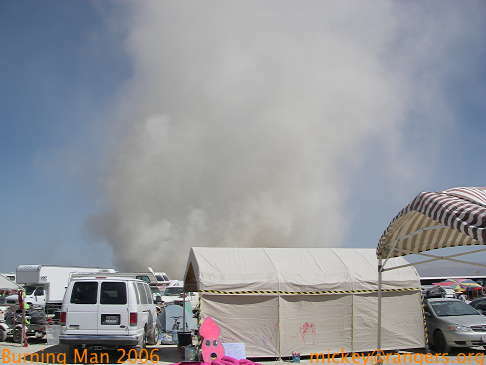 Proper playa structures can withstand fierce wind for a good long time. Most commercial offerings can't, even when staked down. 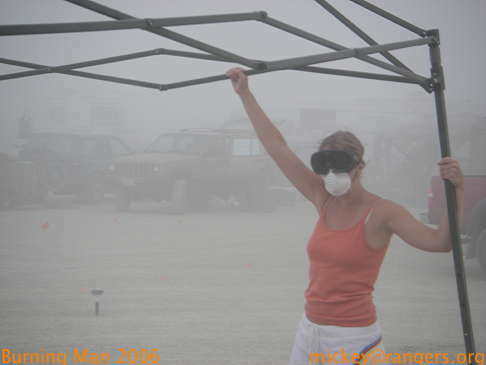 Here's a participant interrupted while setting up an awning-style shade structure. 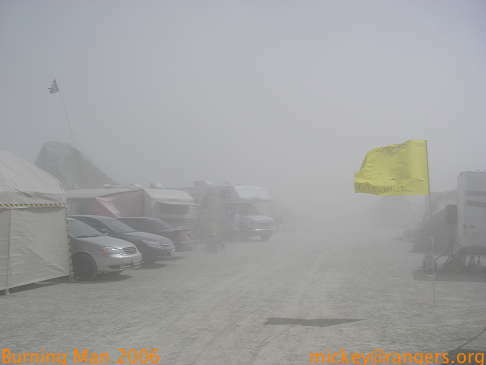 With the canopy on it more wind will be caught, and it'll undoubtedly be broken in a few days, if that long. 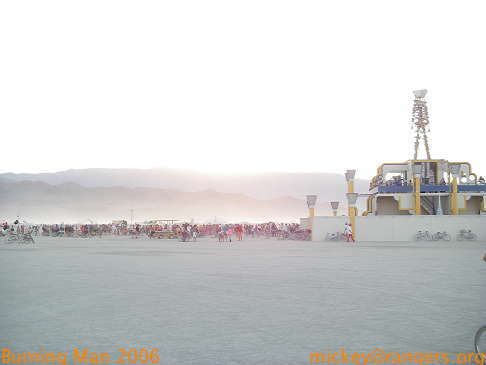 Everything clears out by dusk, and crowds return to the Man. Most of the winds seem to be driven by the sun, and things calm after sun-down. While we're in the neighborhood, let's check out the Man.